I like the Harry Potter books. Not in a ‘I-have-a-Hufflepuff-tramp-stamp’ crazy-fan kind of way, but I have read each of the books and seen the corresponding movies. I remember watching one of the films with Caitlin once and she said, “I like these movies, but when I read the books, I imagined Hogwarts to be on a much grander scale, didn’t you?” Without needing to think about it, I replied: “nope, I just pictured Hogwarts as my high school”. And that was the day I realised: I was born without an imagination. When I analyse it, every book I’ve ever read, I imagined taking place in settings I’ve already visited in real life (or IRL for people who speak internets). Even the most lavish account of a magical castle described by JK Rowling, the most successful fiction author in human history, just goes through the production-line in my head and comes out as the H Block of Birkenhead College. So planning a new home is a bit of a challenge for me. But we did get there in the end. Enough with all the typey-typing, you want to know how the process works. We signed the contract on our piece of land through the real estate agent, which included a 20 working day due diligence clause. Basically, this means that the buyer (us, in this case) has 20 days to do some homework and decide whether it’s going to be viable for them to build on that piece of land before any money changes hands and either party is committed to the sale. I’d advise to see if it’s possible to have this clause added to your contract when buying land. During the due diligence period, we basically had to establish one thing: does the site allow for us to build the home and come in on-budget? The way you do that is create plans for the house and get an accurate quote on how much it would cost to build that house on that piece of land, when taking into account site-specific GeoTech reports and land surveys. The bank wouldn’t have lent the money to us based on a rough estimate and we couldn’t have committed to selling our existing home without knowing what we were getting ourselves in for. So you need plans that are almost finalised and have an accurate idea of how much it would cost to turn those plans into bricks and mortar IRL (there’s that acronym again). Our home company, Sentinel Homes, helped us through that process. It’s worth noting at this point that 20 working days isn’t a long time in the construction industry. 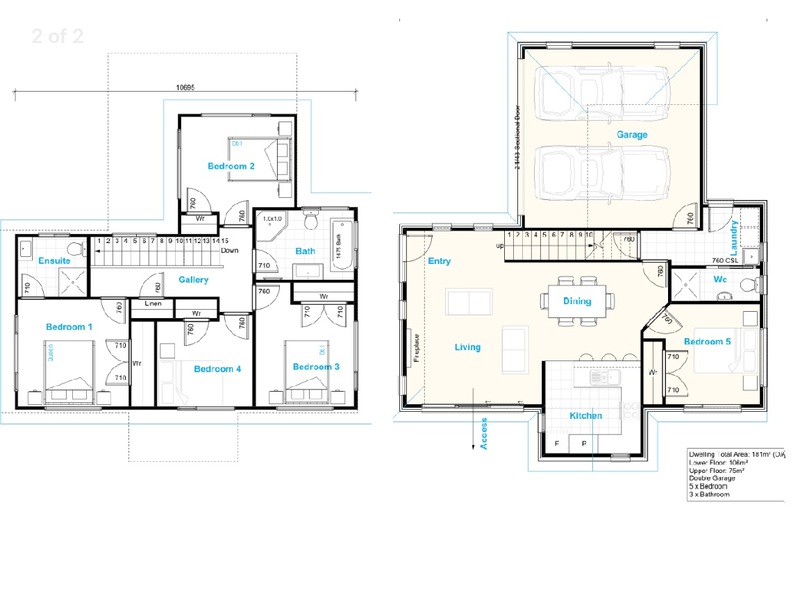 During this period, we took our ideas to several house builders in Auckland who said it wasn’t possible for them to create plans and get a quote done in 20 days. So that counted those builders out straight away. Sentinel not-only told us it was possible, they made it easy. There’s lots of decisions to be made. And this is where I need to re-mention that I’m not great at imagining how the final house will look. If you’re anything like me, there are things you can do to help. The most obvious one is to talk to someone who is better at it than you. Your contact at the building company is a good place to start, or if you have a friend who has built before or works in home building, you can pick their brain. The other thing is to visit showhomes. We visited all the Sentinel showhomes in daytrip driving-distance from our house, as well as dozens of showhomes from other home building companies. This gives you a pretty good idea of what certain finishings and options will look like. 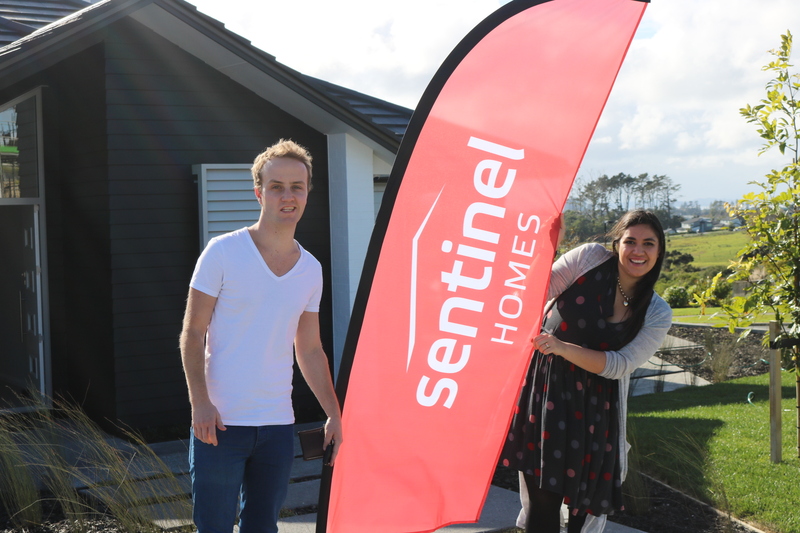 THIS IS US VISITING THE SENTINEL SHOWHOME IN MILLWATER TO GET SOME INSPIRATION. THE HOUSE IS AN ABSOLUTE BABE. HIGHLY RECOMMEND VIEWING. Oh, and future-proofing. When you look at building a home, people throw around the phrase ‘future-proofing’ like they receive a dollar for every time they can mention it in conversation. They’re basically just trying to make sure you make decisions that enable you to live comfortably in your home for years to come and not just build for what will be suitable now. Are you nearing retirement and your knees aren’t what they used to be? Then probably don’t build a house with 56 flights of stairs. Are you looking at adopting 14 children and raising them to be an all-star gymnastics team? Then probably don’t build a house with only one bedroom. Stuff like that. LISTS, LISTS, LISTS. MAKE A LIST BEFORE YOU GO INTO ANY MEETINGS OF ALL THE THINGS YOU WANT TO COVER-OFF. THIS WAS THE ONE WE TOOK TO OUR INITIAL DESIGN MEETING. We decided to build a two-story home to try and get a glimpse of the water in Stanmore Bay. This meant we had to decide whether to have our living room upstairs and utilise the view or have the living downstairs and have it open out onto the lawn. In the end, we compromised and have the living downstairs so you can entertain in the summer and upstairs we have the (currently spare) bedroom that faces the view, which will have a couch in it so you can still take people upstairs for a coffee and see the water. The real estate agent for the land put us in contact with Deb from Sentinel, whose role is to get you through the contract stage. Deb organised a meeting with Lifestyle Architects, who are the designers Sentinel Homes use to draw up your plans. Deb came along to our first meeting with Lifestyle Architects where you talk about what you need from the house and what you want from the house. Then you work together to make those two goals intersect, like a Venn diagram of judiciousness. 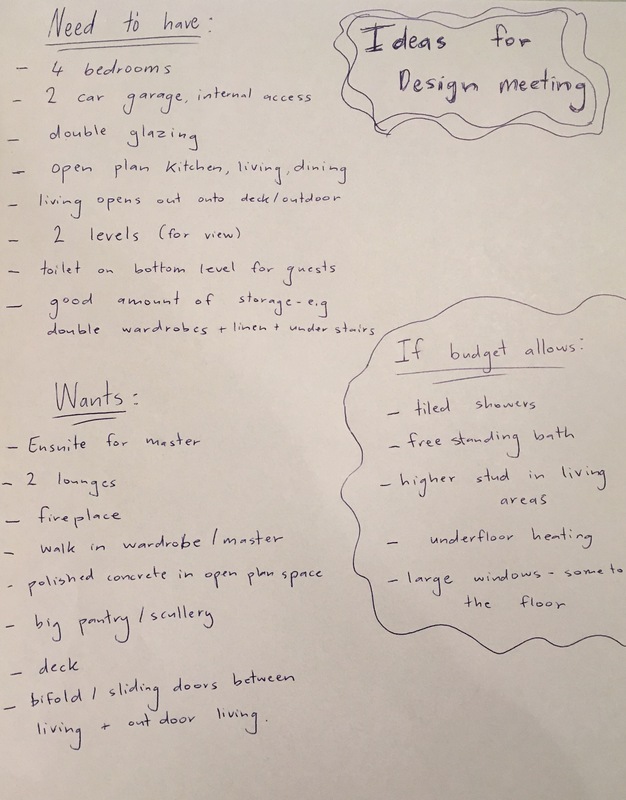 We needed some things: to come in on-budget, a certain number of bedrooms, a garage, open-plan living etc. We wanted other things: to use certain types of materials, more than one bathroom, to win lotto and be announced as the next in-line to the thrones of the British Empire etc. Lifestyle Architects took all of those goals into consideration and told us which ones were realistic and which ones needed some refining. They then drew up a plan for a house to go on our site that we could use to get an accurate estimate from Sentinel’s quantity surveyors. One thing that came up during this process was that the soil quality on our land was substandard. This meant that we would require some in-ground piling and quite a bit of extra retaining. Truthfully, those feel like dumb things to spend your money on. They go underground and you don’t get to see them easily in the finished product like you would with a shiny kitchen benchtop or something. But knowing this during the due diligence phase meant we could make an informed decision about the build and whether we still wanted to go ahead. In the end, we were able to mitigate the cost of the earthworks and foundations by scaling back the specifications of our house a bit. We still got the layout we were aiming for, but Sentinel and Lifestyle Architects helped us to choose more cost-effective cladding and fitting options to bring us in on-budget. By this stage, we had drawings for our new home that were pretty close to how the final house was going to look and a very accurate costing for how much it was going to be to make that become a reality. We took it all to the bank and our lawyer and could sign the contract with Sentinel Homes for our new place. There’s still opportunity to change and refine things, but at least now we’re comfortable that we can make it all work and end up with a home we’re happy with. In the next post, we’ll take you through how we refined these initial plans and chose the specifics, like the kitchen, bathroom fittings and colours. LIFESTYLE ARCHITECTS CAN DO COOL THINGS LIKE GIVE YOU 3D RENDERS OF HOW THE HOUSE WILL LOOK. THIS IS ONE THEY GAVE US TO HELP US DECIDE WHETHER TO USE ALL PALLISIDE (WEATHERBOARD LOOK) OR HAVE BRICK ON THE BOTTOM LEVEL. AFTER WE GOT OUR PLANS BACK, WE WENT AND HAD A PICNIC ON THE SECTION TO TRY AND IMAGINE HOW EVERYTHING WOULD LOOK, NOW WE HAD A SPECIFIC HOUSE IN MIND. EVEN WE KNOW THAT’S A LITTLE BIT WEIRD. BUT SOMETIMES EXCITEMENT EXPRESSES ITSELF IN PICNIC FOODS.